Just a few years old, the group plays only Brazilian jazz, including original songs - such as Snows Samba - by band member Thiago Camargo. Camargo said the band plays a large repertoire, but unique to this area. He said that the set list is similar to jazz one hears in Sao Paolo, Brazil. In addition, the band includes tunes with more original rhythms from Brazil. 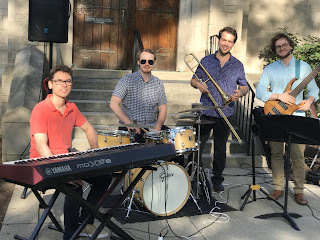 Members of the group include Kevin McClellan, a member of Knox Church, bass; Matt McAllister, drums; Thiago Camargo, keys; also performing on occasion is the “+ 1" Zach Granger, trombone. Most of group met at the jazz program of the College- Conservatory of Music at University of Cincinnati. Camargo received his master’s in music from CCM. He also participated in a CCM exchange program in Brazil originated by Phil DeGreg, former professor of jazz studies and long-time jazz pianist, now retired. McClellan crossed paths with McAllister during the Brazil exchange program. Originator of the band, Camargo also teaches piano throughout the Greater Cincinnati area. McAllister has a master’s of music in composition from CCM. McClellan has a bachelor’s of music from CCM. Granger has a master’s in jazz studies from CCM. The group plays a number of gigs throughout the Greater Cincinnati area including Dee Felice Café in Covington, Kentucky. For more information, contact kevinmclellanmusic@gmail.com.